OK, this may be getting boring, but repetition is the key! 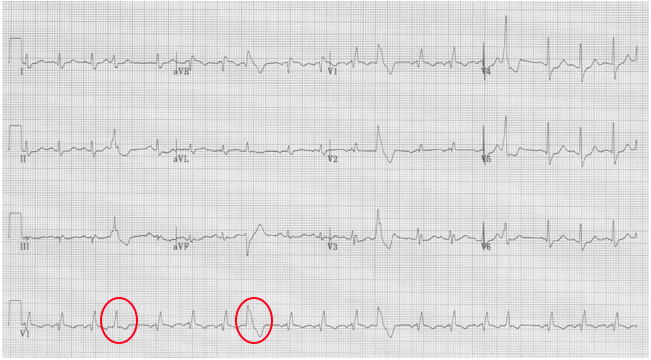 These are all ways of saying the same thing – this premature beat is a premature ATRIAL beat! 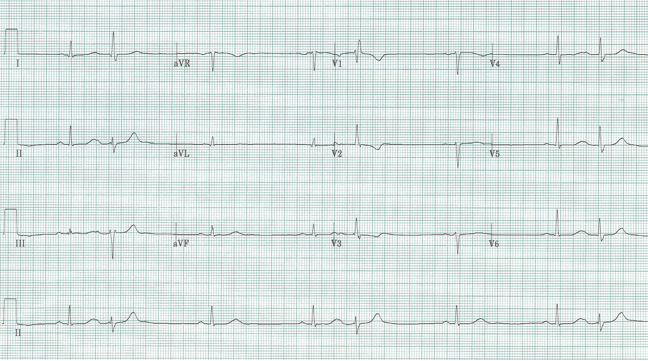 This rhythm strip actually has four premature beats – all are PVCs (premature ventricular contractions). 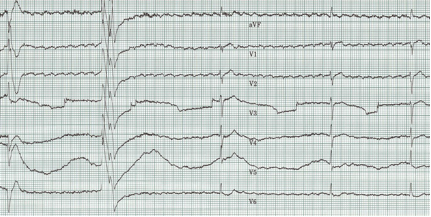 You can be assured of this diagnosis because the beats are dissociated from the sinus rhythm – that is, the sinus rhythm continues through the rhythm strip, the early complex does not reset the sinus metronome as would an early atrial depolarization. Thus the early beat must be ventricular in origin. Recognizing dissociation of a PVC is simply another way of saying that there is a “fully compensated pause” – the sinus beat comes back right on time. Young Iraqi man with atypical chest pain and pre-syncope. This striking EKG is typical of an unusual form of hypertrophic cardiomyopathy – apical hypertrophic cardiomyopathy, or Yamaguchi syndrome. This type of HCM is relatively common in the Japanese population, where it was first described, but occurs rarely in other populations (3% of all hypertrophic cardiomyopathy in the US). Siewe D, et al. King of hearts for ace of spades: apical hypertrophic cardiomyopathy. Am J Med 127:31-33, 2014. 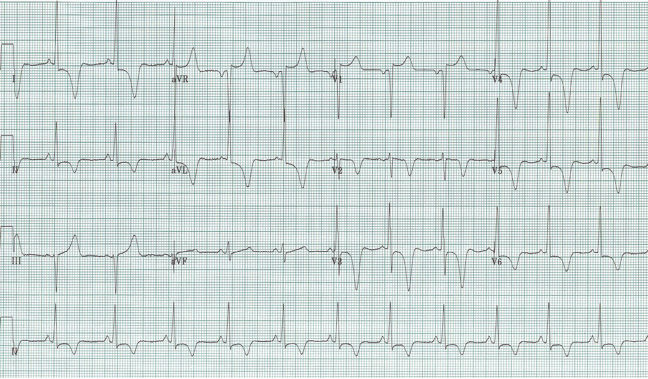 Pillarisetti J, Gupta K. Giant inverted T waves in the emergency department: case report and review of differential diagnosis. J Electrocardiol 43:40-42, 2010. The diagnosis depends on the P wave or atrial activity. Remember Marriott likes to say “cherchez le P.” In this tracing there is something midway between QRS complexes, seen best in the inferior leads, especially lead II. This is a flutter wave and the rhythm is 2:1 flutter! 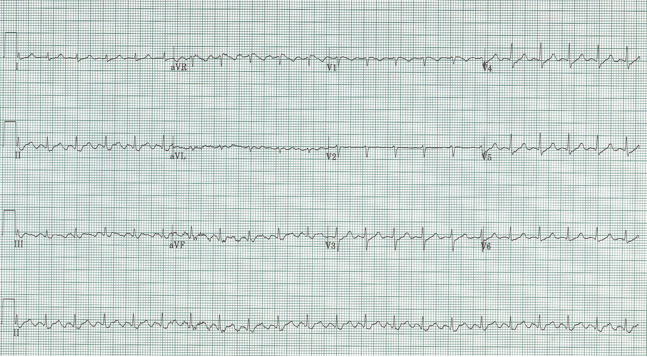 Notice the broad “S wave” at the end of QRS complexes in the inferior leads – actually this is a part of the other flutter wave (occurring at a rate of approximately 300/minute) superimposed on the QRS. Look at all the flutter waves now!